First time in Canada: Surgeons at The Montreal Children’s Hospital and McGill University successfully remove a tumour from a baby’s face..… through his scalp! Home > First time in Canada: Surgeons at The Montreal Children’s Hospital and McGill University successfully remove a tumour from a baby’s face..… through his scalp! September 1, 2009—Montreal: Surgeons at The Montreal Children’s Hospital of the McGill University Health Centre and McGill University used a novel approach for the first time in Canada to remove a tumour embedded in the upper face of Jayden Cambridge, an 18-month old child. Using a new endoscopic technique, the surgeons entered from the toddler’s scalp, above his hairline, to retrieve the tumour located in the middle of his forehead. Thanks to this new procedure, the little boy will be spared an unsightly scar, and instead has a tiny one hidden by his hair. This ground breaking surgery, which took place on August 27, 2009, was performed by Dr. Nabil Fanous, Associate Professor of Facial Plastic Surgery and Head and Neck Surgery at McGill University and Université de Sherbrooke and by Dr. Sherif Emil, Director of the Division of Pediatric General Surgery at The Montreal Children’s Hospital and Associate Professor of Surgery at McGill University. The surgery proved more complicated than anticipated. After the endoscope and attached camera were introduced inside the upper face, the tumour was nowhere to be found! To locate it, the lead surgeon Dr. Fanous had to probe the forehead using special instruments. As it turned out, the tumour was hidden under a bony shell that had grown over it. The shell was thin in the middle, much like an egg, but thicker on the sides. Dr. Fanous had to delicately pierce the shell to excise the tumour, and then pull it out via the tunnel leading to the child’s scalp. The tumour was the size of a large blueberry (it measured about one by one centimeter) and was sitting in a deep bony crater that looked on the computer screen a bit like a small volcano. Dr. Fanous smoothed down the contours of the crater and filled the indentation with bone wax to make sure Jayden’s brow would be perfectly smooth. The Montreal Children’s Hospital believes this is the first time an endoscopic procedure has been used in Canada to remove a facial mass on a child’s face through a tiny scalp incision. As well, this is the first reported case of such a tumour being covered by bone. The child was discharged about an hour after surgery. He has recovered rapidly and fully since. Dr. Sherif Emil was the first surgeon to examine Jayden in late 2008. He determined the toddler had a congenital tumour, possibly of the type called ‘dermoid cyst’. While this type of tumour is benign, it has to be removed because it may grow as the child ages and could rupture, causing serious infection and scarring. Traditionally, these types of tumours are removed by simply cutting through the skin and muscle directly over the tumour. However, this technique leaves a scar, one that Dr. Emil wanted to avoid at all costs since it would be in the centre of Jayden’s forehead. Also, the scar would have gotten larger as Jayden got older, especially since the little boy has dark skin. People with dark skin are known to have much higher risk of scarring. Thanks to the use of this new endoscopic technique, Jayden will be spared an unsightly scar. Instead, he has a tiny scar hidden by his hair. Because this technique had never been used in Canada to remove a facial mass, Dr. Emil began to search for a surgeon with enough experience to attempt it. He finally reached Dr. Fanous, a renowned facial plastic surgeon. While Dr. Fanous had never performed this surgery on a child, he had done it hundreds of times on adults during facelift surgery. 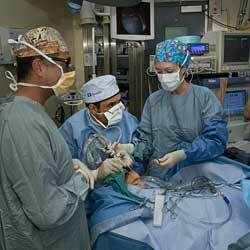 He readily agreed to perform the surgery and to provide the necessary equipment to The Montreal Children’s Hospital. It took eight months from the first time Jayden was seen by Dr. Emil until the day of his surgery. During the surgery, the anesthesia team headed by Dr. Pierre Fiset, Director of Pediatric Anesthesia, secured the child’s safety. A number of surgeons and surgical trainees filled the operating room in order to witness this ground-breaking procedure. The nursing staff prepared tirelessly for the operation, assuring a calm and safe environment for the patient.